What should the mainstream media do when the guy who identified the H1N1 outbreak in Mexico and was a key player and founder of ARGUS, a global detection and tracking system for the early detection of biological events, says Haiti is facing a serious gap in preparedness, early warning, and rapid response regarding pediatric diarrheal disease? If they are doing their homework, they talk to him and other epidemiologists and doctors in the field who say that the big NGOs and the United Nations are fudging the facts about their accomplishments. While in Haiti, we met Dr. Jim Wilson, who among other things, has tracked and identified SARS outbreaks, H1NI, Marburg hemorrhagic fever, and issued the first warning of H1N1 resurgence in the United States in the summer of 2009. Remember the melamine contaminated baby food scandal in China? Well, he was the one who first detected it through via reporting of unusual renal disease in babies there. He has offered testimony to Congress on the Argus Program and to Homeland Security. In the late 1990’s, Wilson worked with the World Health Organization and NASA to examine environmental and climatic activities in Africa potentially associated with the emergence of the Ebola virus. Listen here to one of his presentations. As Wilson reports on his website, and contrary to what the United Nations and Care International have reported , about safe drinking water and sanitation in the IDP camps, the opposite is true. This man is telling the truth. I was there. So was my physician husband, and what we witnessed is beyond the pale. 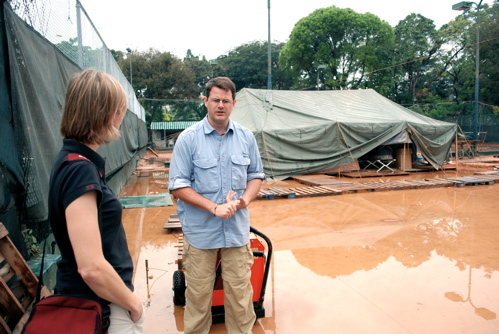 Hand washing is non-existent and raw sewage is flowing throughout the camps. Walk anywhere with peril. Human feces are everywhere, even in the ruins of the Notre Dame Cathedral in Port-au-Prince. 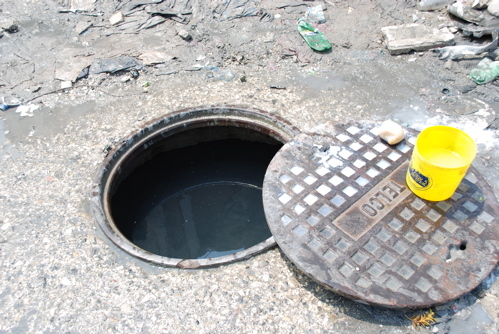 Open sewer grates serve as pit toilets. At the risk of providing too much information, I abandoned my shoes because they had become too saturated with human waste picked up in the camps. Dr. Wilson is pulling no punches and is predicting the possible outbreak of infant diarrheal disease within 30 days. There is no time to waste and it seems unconscionable that CARE would issue a press release, picked up by Reuters (with a disclaimer, but no follow up) that all is well with sanitation in Haiti. The cat may already be out of the bag. 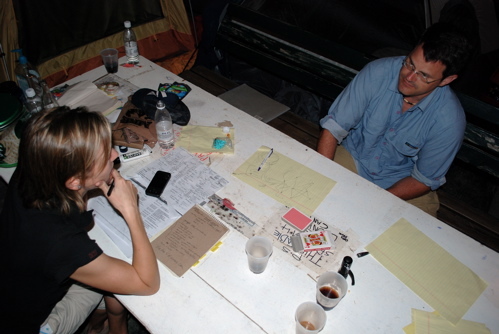 My husband saw and identified cases of infant diarrhea on March 12 in a camp of 5500 outside of Petionville. Here is some raw video of the conditions on that day. When we returned seven days later, a small Irish NGO, HAVEN, was trying to build latrines, but you can imagine what the surrounding grounds were like with 5500 people having no sanitation facilities. Per our discussion in Petionville, there remains a serious gap in preparedness, early warning, and rapid response in regards to pediatric diarrheal disease in Haiti. I am petitioning everyone I can reach to raise awareness of this critical oversight that exists in the current Haiti response effort, an oversight we are able to address if enabled to move quickly. Repeated requests to identify funding mechanisms and an ability to request emergency funds have gone largely ignored, and I think this needs to be addressed by the media at this point. Ordinarily, I would have been on top of Dr. Wilson’s request immediately, but I was incapable. Why? I had picked up the disease myself and have spent the last two days and eight hours of that time with constant bouts of simultaneous diarrhea and vomiting. It was the worst illness I have ever experienced in years of traveling and I can only imagine what it is like for a baby, let alone an adult, to sleep in the rain and mud at night, have no shelter under a blazing sun and 90 plus degrees, and no hope of feeling better. I had access to the best antibiotics and palliative care, including rehydration that is not available to these people. Infants can die within 24 hours of contracting this disease. The rainy season has not even begun yet. Current disease surveillance efforts in Haiti are not operationally mature enough to rapidly identify “outbreaks” or “epidemics” of any disease because no one understands the denominator (i.e. the baseline of disease) yet. We suspect outbreaks have indeed occurred based on pediatric fatalities reported due to dehydration and diarrhea during a period of rain that later ebbed during a period of hot, dry days seen a week ago. Besides, antibiotics, which are scarce to nonexistent in the camps, rehydration is critical, and can involve the simple concoction of sugar, salt and water found in Pedialyte. Aid organizations report there are 800,000 doses of Pedialyte available in-country. It’s not as if the early warning signs are not there that the bacterial and biological agents responsible for disease have not been identified. Laboratory samples received at the Haiti National Public Health Laboratory since January 27 indicate the following waterborne infectious diseases are confirmed active in the country–hepatitis A, leptospirosis, salmonellosis, and shigellosis. Informal lab results showed coliforms and Giardia in drinking water. These reports are compounded by identified mosquitoborne illnesses of malaria and Dengue Fever, which are more of a threat to aid workers than to the Haitian people at this point. 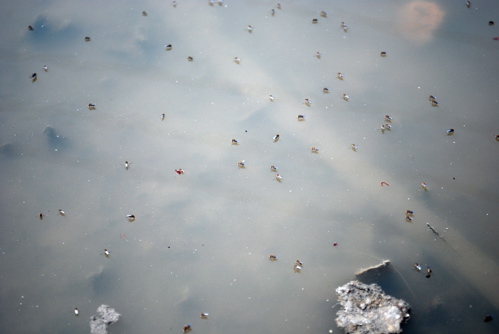 Image: Mosquitoes hatching in pooled water. On March 22, OCHA, the United Nations office that coordinates humanitarian affairs, issued a report that supports Dr. Wilson’s concerns. The average number of people per latrine, where there are latrines is 411, with a total of 4,275 latrines are needed to assure minimum standards and 10,687 to assure Sphere standards. In Cite Soleil, which is the poorest area, less than 28% of respondents had received any aid from relief organizations. There is lack of follow up on medical care, if any at all. Again, we witnessed this area first hand. The lack of even the basics of shelter and water is obvious, and the fact that this area has been so ignored is a travesty and immoral. We also witnessed first hand the fear of aid organizations to go into these some of the camps, while we traveled freely with no armed guards or personal protection. I told a friend here in the States that I felt they were cowards. She replied, “They are despicable cowards,” and I would now echo that sentiment. So what do we do when there is no time for hand-wringing and recriminations because aid organizations will not share information because they are protective of turf and funding? “We are in bad, urgent need of funding to do this,” he wrote this morning. “We cannot obviously build a US-comparable sewage system, but the provision of adequate drainage would at least keep raw sewage from flowing through folks’ tents and shelters, Wilson says. The above said, it is my belief there are certain things we can do, and many that are insurmountable before the coming rains. Note we are taking a posture of mitigation and expected response. It is our belief it is important for the Haitian public to see and understand we will do everything in our power to mitigate the threat of diarrheal disease, which is a leading cause of morbidity and mortality in Haiti’s children, and the top candidate for causing an unexpected and non-routine excession of mortality in the next 30-60-90 days. Wilson is using social networking via Twitter and Geochat to link data. What is Geochat? It is a very powerful text message capability to enable us to rapidly inform each other of events or to simply ask a pressing question about a possible infectious disease event. You can even run RSS feeds through the group, as we will do for our Situation Reports and advisories. This enables you to have nearly instantaneous access to information even while in Haiti, so long as your phone is turned on and you are in range. Want to join? Click on this link, or copy & paste it into your browser’s address bar if that doesn’t work. You can also follow Dr. Wilson on Twitter. Image: Wilson and Keenan at flooded camp area in Petionville. Haitians refer to this camp as the the “Club Med” of camps. An added note. Dr. Wilson, Like Dr. Tiffany Keenan, is currently funding his work through his own 401K. It is running out and he is concerned about his own family’s welfare back in Seattle. Why are we letting this happen when millions and millions of dollars are being literally flushed down the money pit in Haiti?